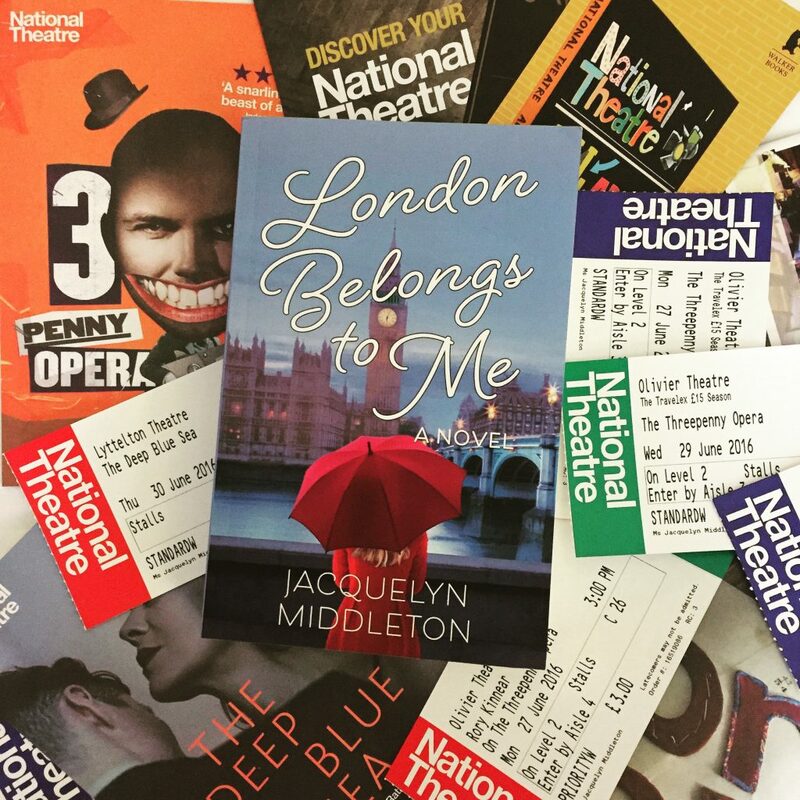 One of the reasons I wrote London Belongs to Me was to celebrate London’s innovative theatre scene. 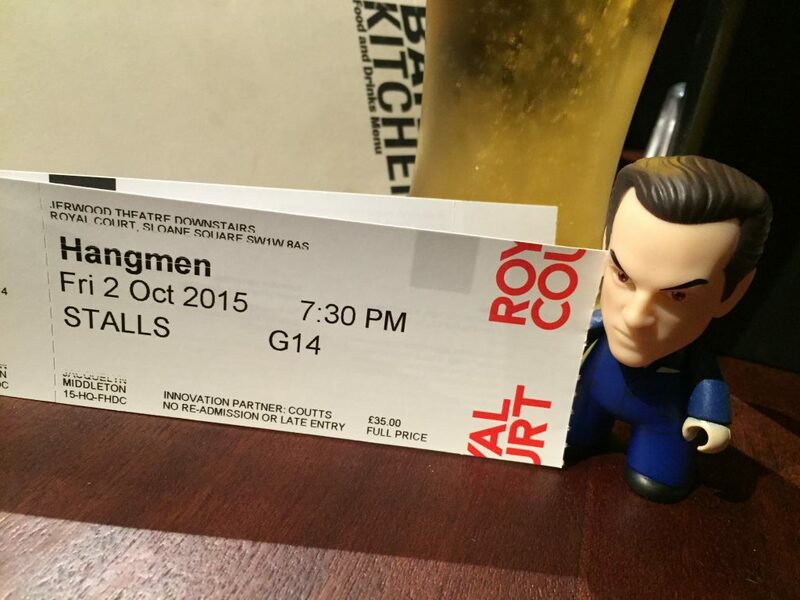 For me, a visit to London is not complete without a seeing a play. Well, actually, that’s not entirely true … I’m more apt to take in a play every single night—and some afternoons, too. I usually see nine or ten plays during a weeklong stay. I tend to choose plays over musicals, so when creating Alex’s story, I headed in that direction. 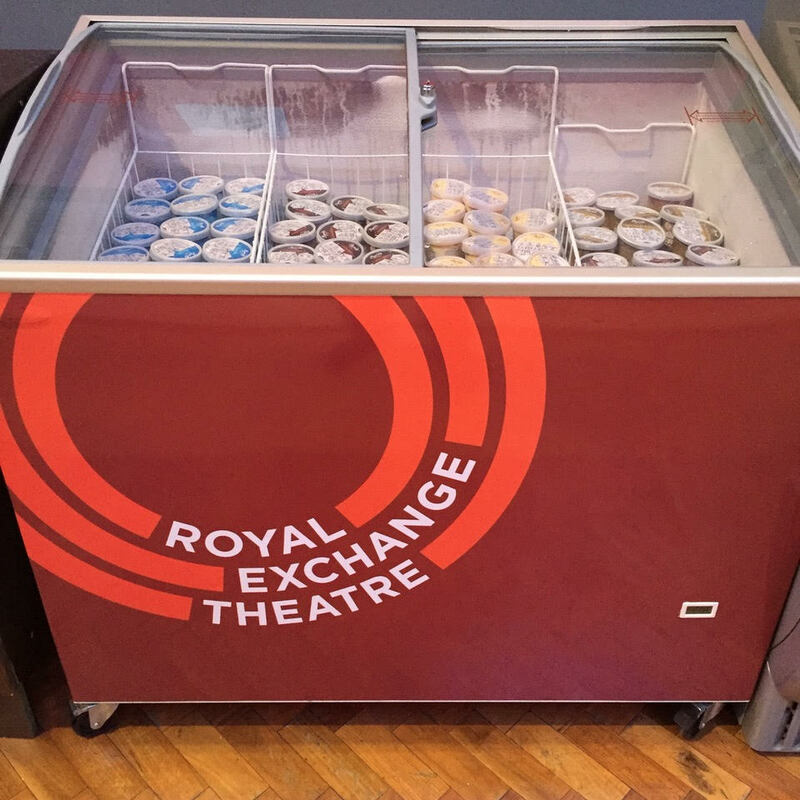 There are literally hundreds of theatres in London. 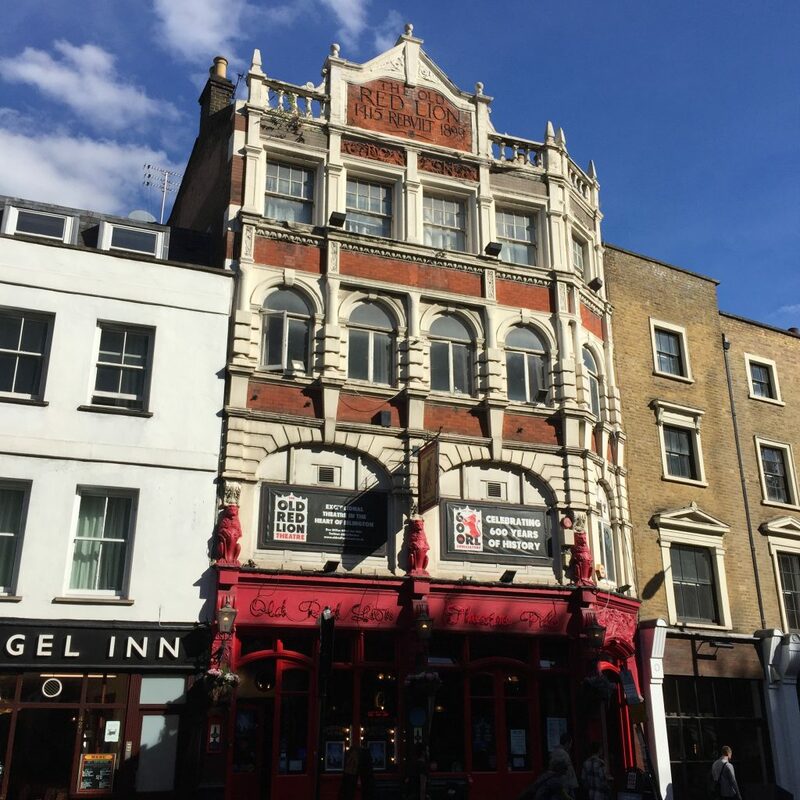 Just take a wander through the West End, around Covent Garden, the Strand, and Shaftsbury Avenue, and you’ll find yourself deep in London’s ‘Theatre Land’. The grand dames of London’s glorious theatre scene such as the Gielgud, the Garrick, and the Theatre Royal Drury Lane hold court here. But London also boasts less refined performance spaces, too. 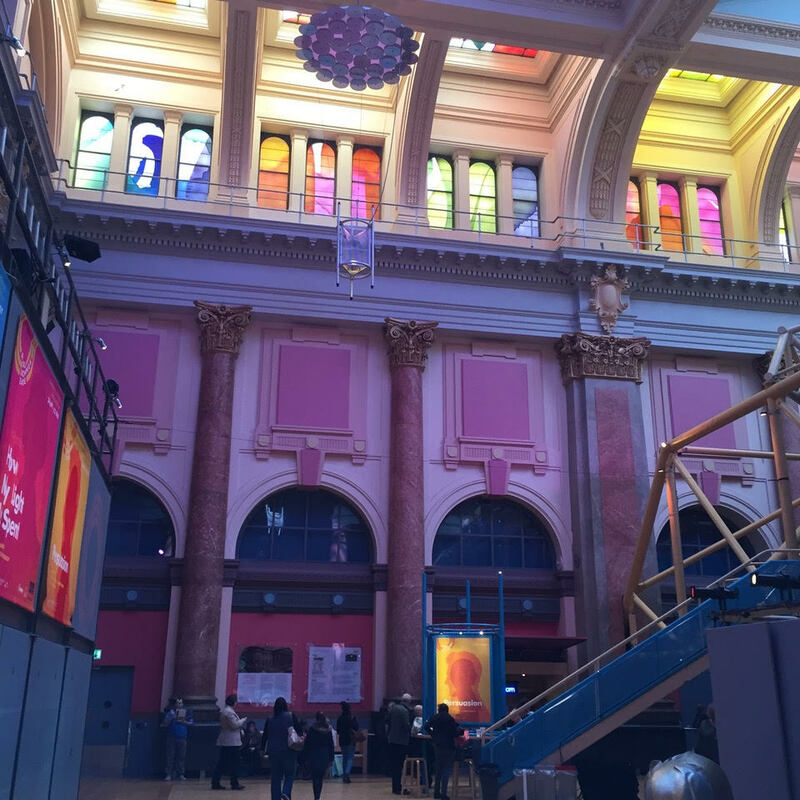 You’ll find theatres above pubs, in basements, and attached to restaurants. 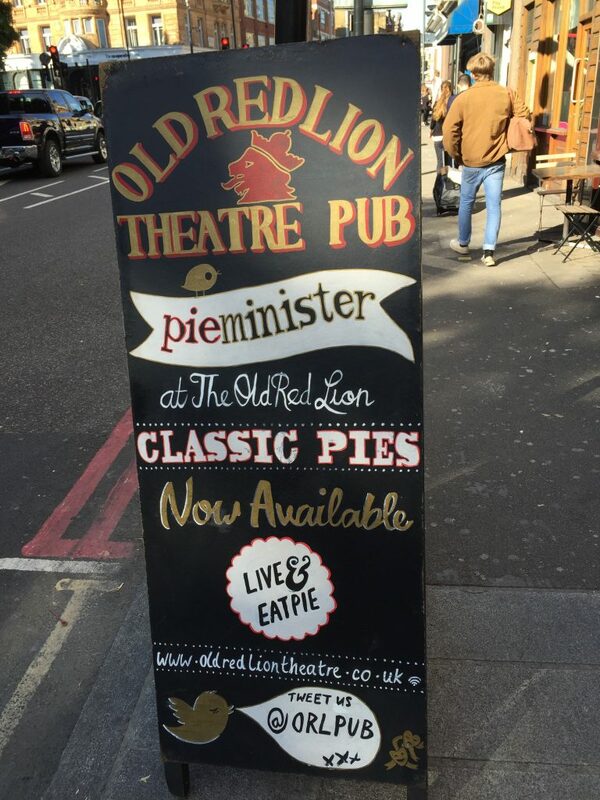 In The Castle pub scene in LBTM, The Old Red Lion Theatre is mentioned, and yeah, it’s literally upstairs in an old pub! For Alex’s journey, however, I chose venues that were well known, but outside the traditional ‘Theatre Land’ geography. 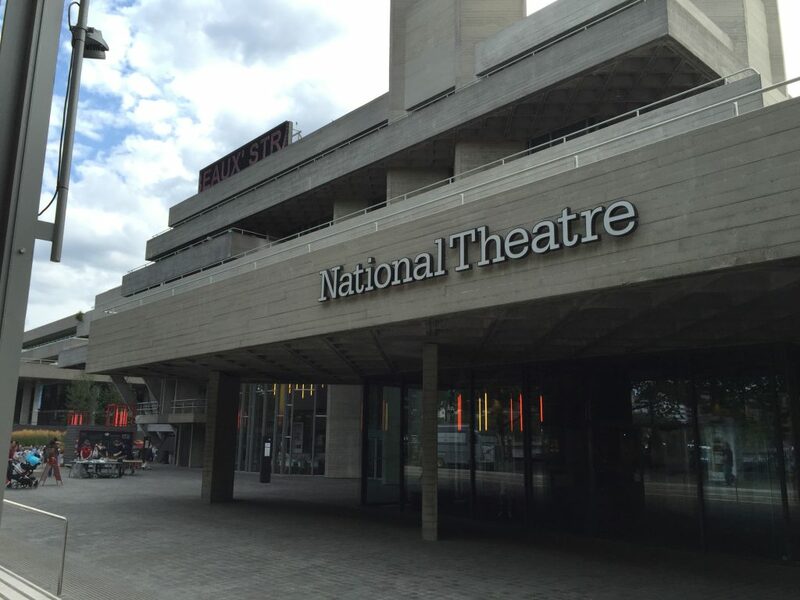 In my mind, there were two places that had to be featured: The Royal Court, and The National Theatre. I also wanted to include the Young Vic, and Almeida, two theatres with a younger vibe that suited Alex’s sensibility. 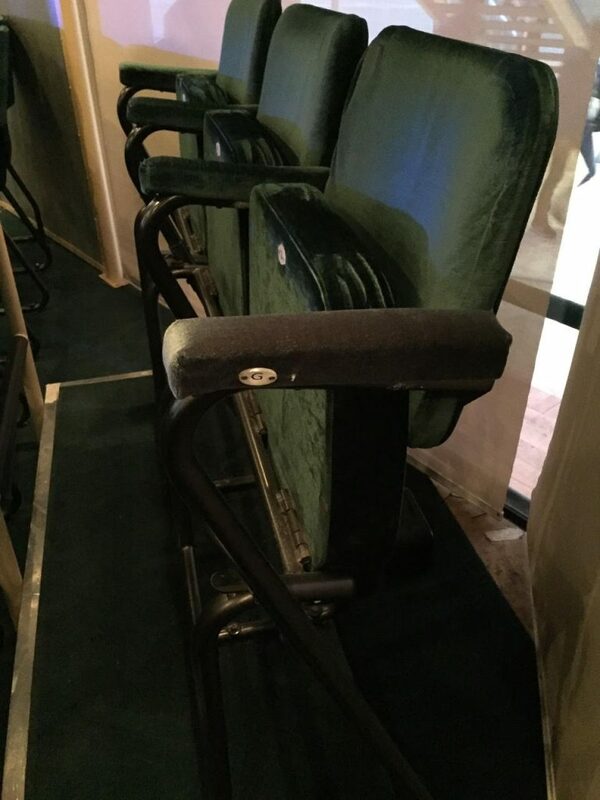 Without giving away spoilers, let’s take a look at the theatres closest to Alex’s heart. 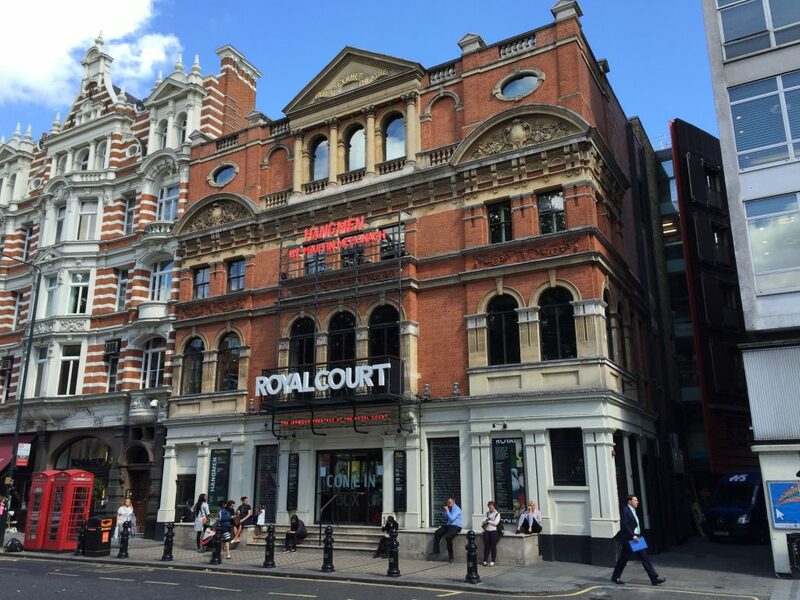 Tucked into fancy pants Sloane Square in London’s borough of Chelsea and Kensington, the current Royal Court Theatre was built in 1888. 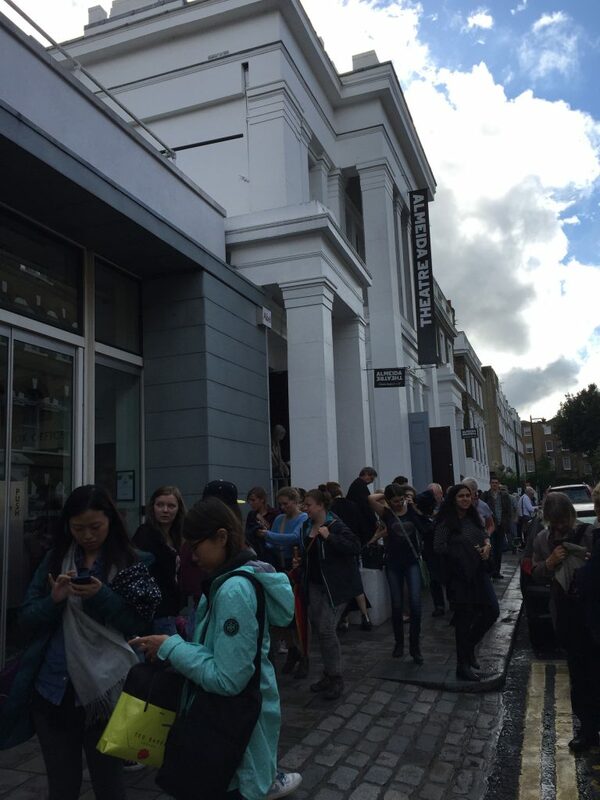 The building actually houses two theatres, the proscenium-arched main auditorium, the Jerwood Theatre Downstairs (seats 370 people), and the smaller studio space, the Jerwood Theatre Upstairs (capacity approximately 85 people). There she is! Note the neon marquee that advertises the play that’s currently on in the Jerwood Theatre Downstairs (when I snapped this photo it was Hangmen by Martin McDonagh). 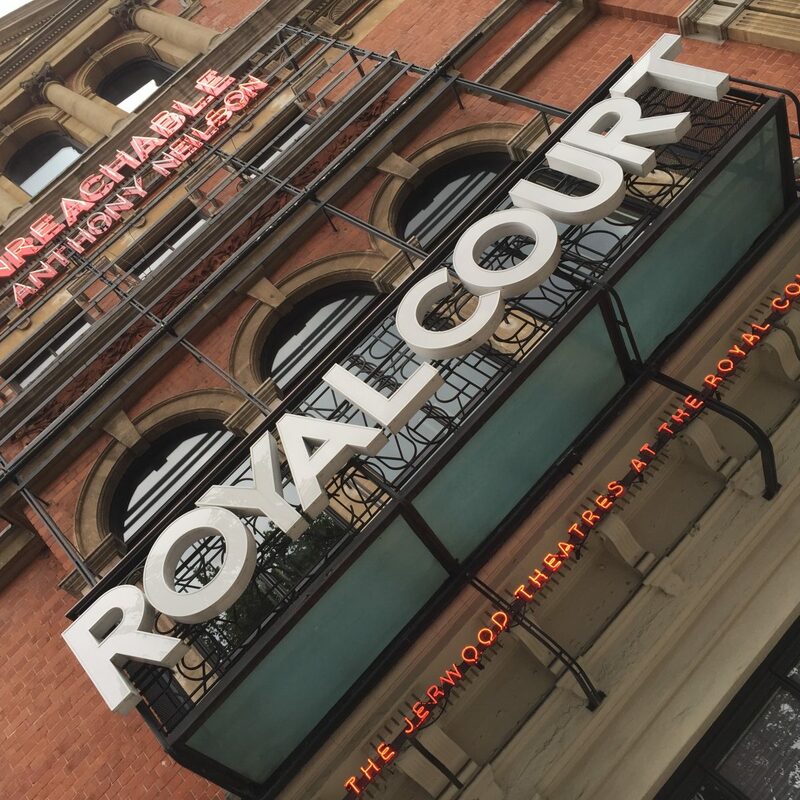 The Royal Court always posts the name of the play and the playwright. The stage door is in the alley to the right of the theatre. 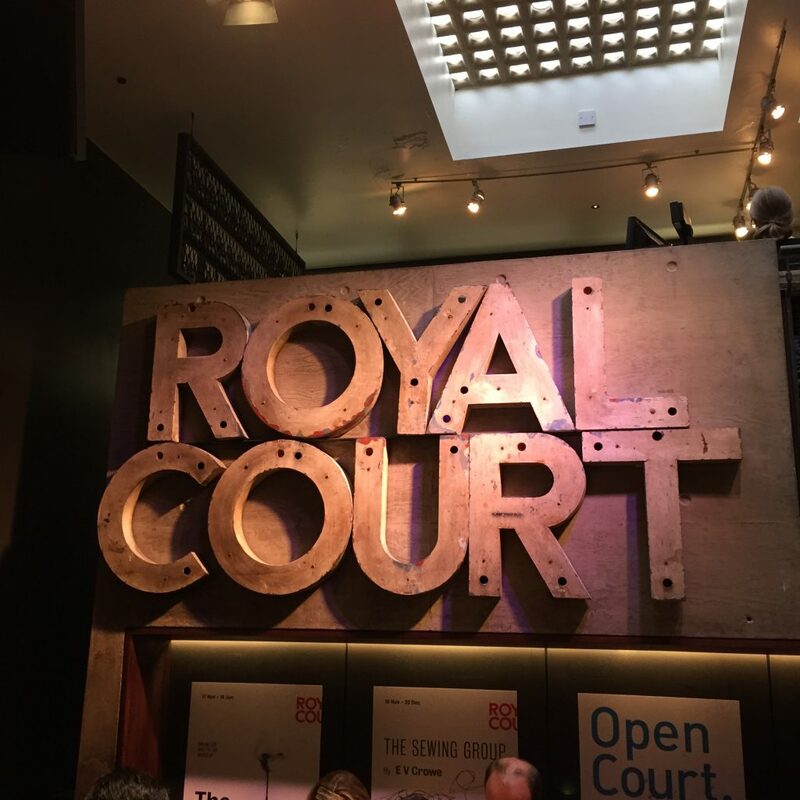 The Royal Court prides itself on finding new voices, and launching the careers of playwrights. Its Literary Office receives more than 3,000 unsolicited scripts a year from both emerging and established writers. 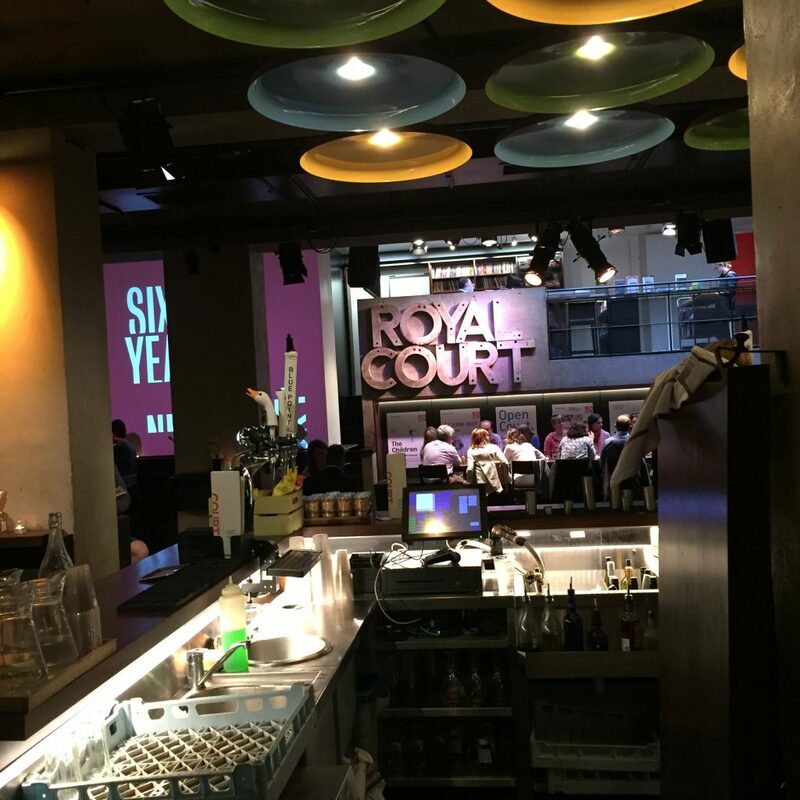 For someone like Alex with no connections or performed work, the Royal Court screams opportunity. Is it any wonder it is such a draw for playwrights starting out? Standing proud on the South Bank overlooking the Thames and Waterloo Bridge is the National Theatre. Don’t let the name fool you. The National is home to three auditoriums: the largest space, the Olivier seating 1,500; the Lyttelton with its 890 seats, and the 450-seat Dorfman. It also offers soaring public spaces on several levels, popular bars, restaurants, and a cozy café called Kitchen. The National also has a terrific bookstore where you can purchase playtexts, theatre souvenirs, and gifts you can’t find anywhere else. I went to a lot of plays at the National back in June! Alex and her friends spend a lot of time here … The National becomes a home away from home for several of LBTM’s cast. 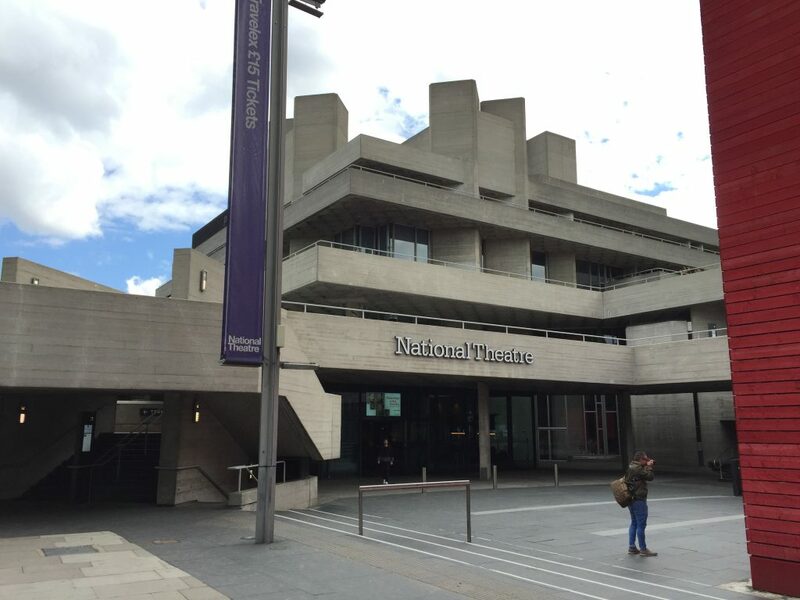 In another post, I did a more in-depth look at National Theatre, its tours and that lovely, can’t-stay-away-from café, Kitchen. A few streets south of the National Theatre you will find a road called The Cut. Two key London theatres live here: The Old Vic and the Young Vic. 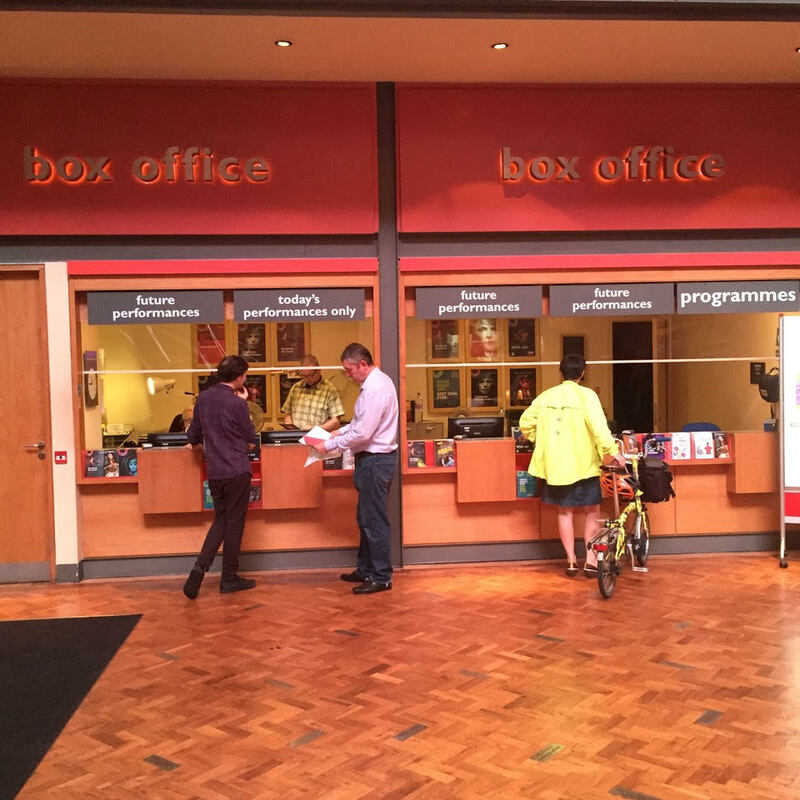 Both theatres are must-visit venues. The Old Vic is beautiful and glitzy inside with a rich, theatrical history, while the Young Vic is modern, edgier, funkier. 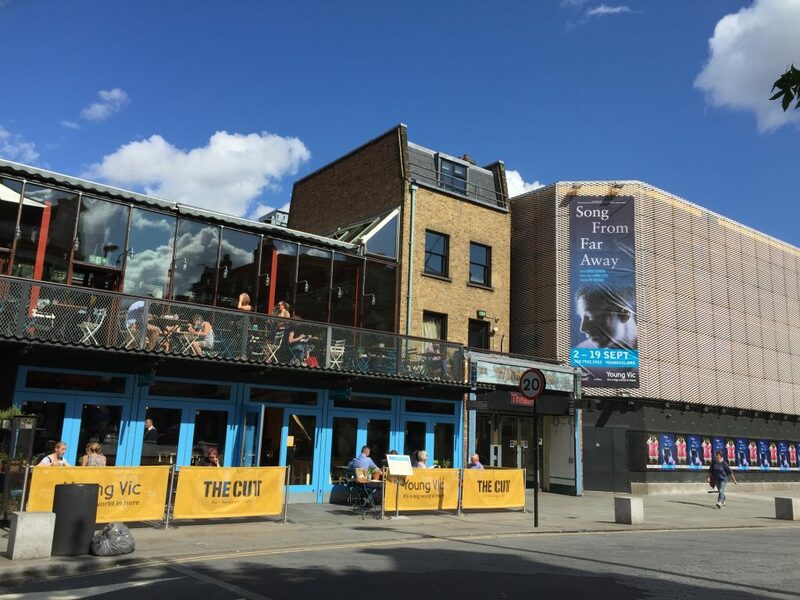 For London Belongs to Me, it’s the Young Vic that takes the spotlight. Sorry, Old Vic! 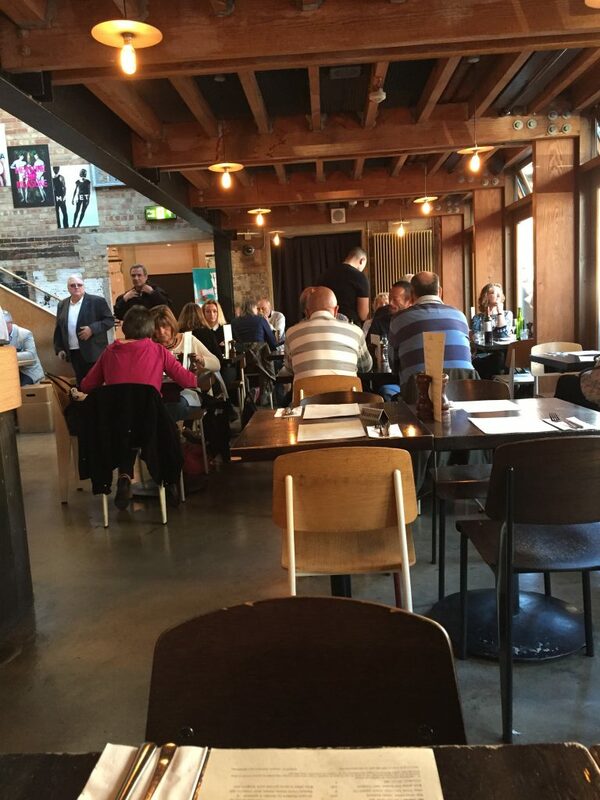 Well, actually it’s the Young Vic’s lively bar and restaurant, The Cut, that plays host to Alex and the gang. The two-level venue offers an eclectic drinks and food menu, and is always busy (at least every time I’ve been there). On a sunny day, there’s no better place that sipping a drink atop the balcony overlooking The Cut. 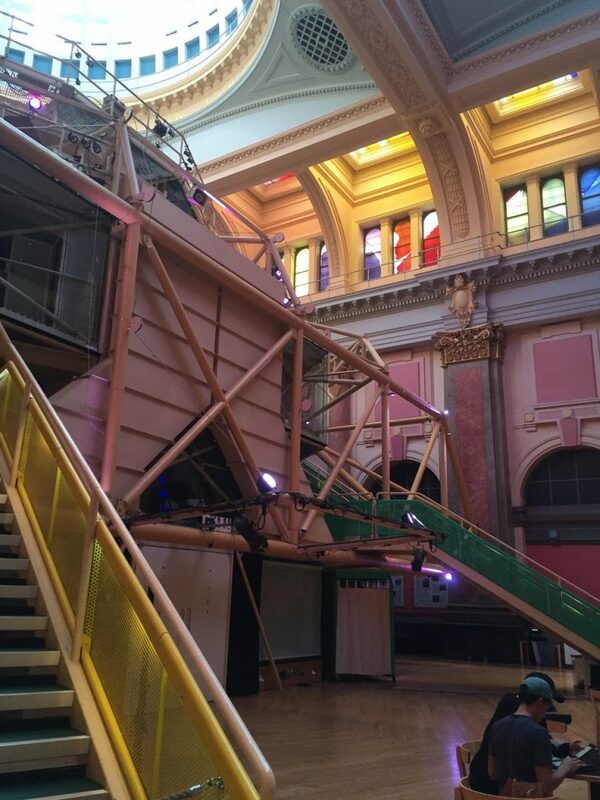 The theatre space, while not in a LBTM scene itself, is a terrific venue with an industrial feel that celebrates diverse and unique stories. Leaving South London behind, we’re heading north to trendy Islington. 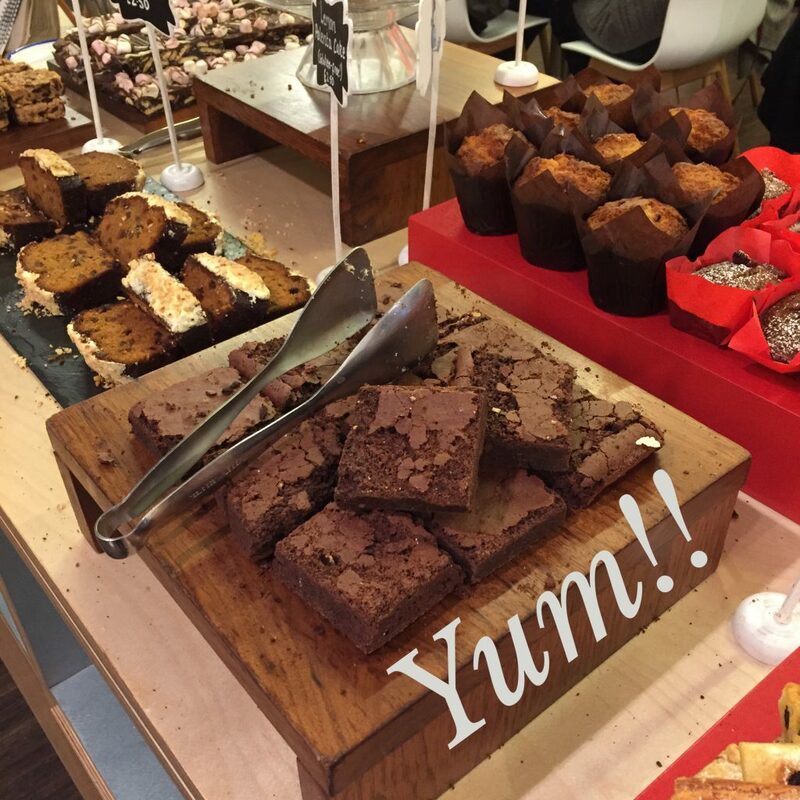 Tucked around the corner from Upper Street on Almeida Street is … The Almeida. Ah, I love this theatre. It’s intimate, seats only 325 people over two levels, and showcases works ranging from Shakespeare to world premieres of established playwrights. Its foyer also boasts a café in the daytime, and a bar in the evenings. One of my favourite plays (and performances! 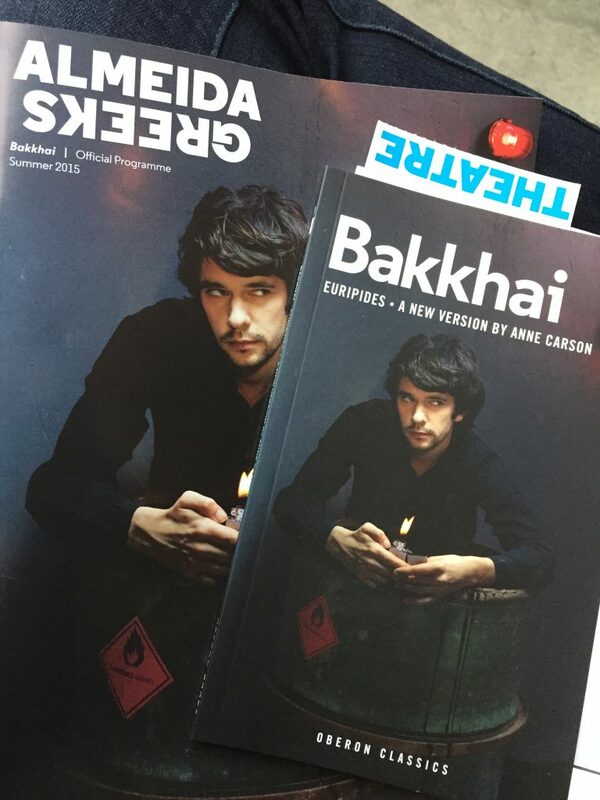 ), Ben Whishaw—yep, Alex’s fave actor—in Bakkhai at the Almeida. He starred alongside Bertie Carvel. Alex and her friends see a play here and have an interesting encounter afterwards in the Almeida’s bar. 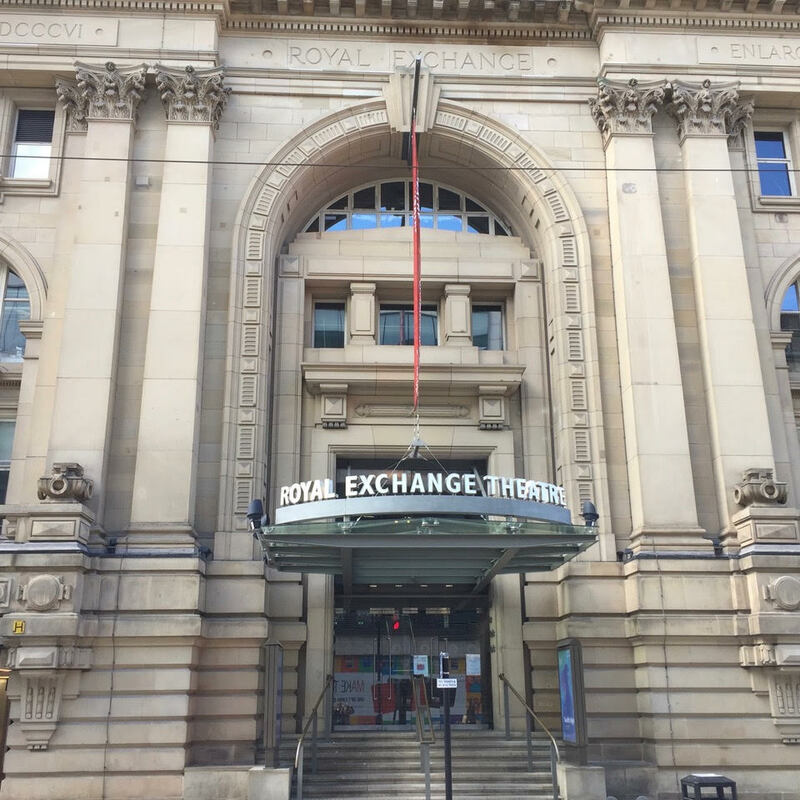 We can’t talk theatre without featuring Manchester’s grand dame, the Royal Exchange Theatre. 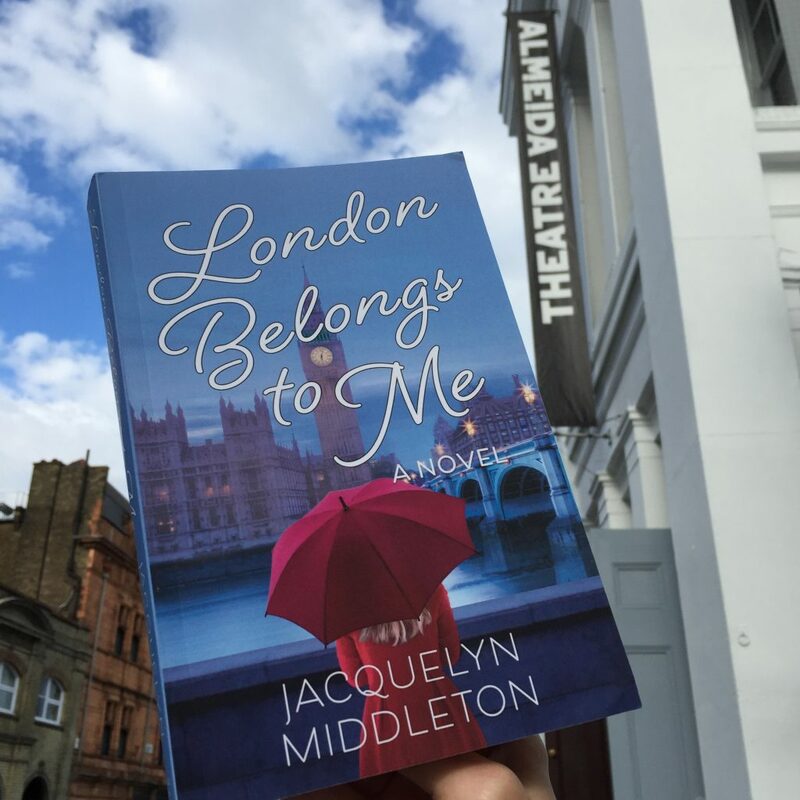 If you visit London or Manchester, be sure to visit the theatres mentioned in London Belongs to Me and London, Can You Wait?—whatever your taste, I’m sure to find a play or musical that you’ll love! 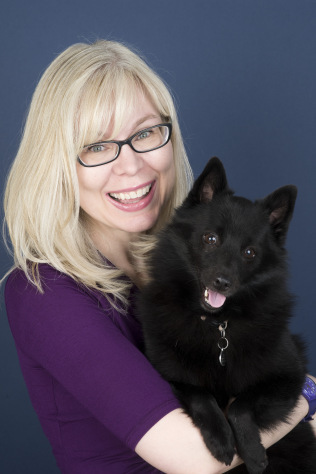 For more behind-the-scenes glimpses into LBTM and LCYW, check out who inspired me to start the novel, take a look at the pubs featured in the pages, the importance of music, and why the ‘meet-cutes’ in London Belongs to Me aren’t as far-fetched as some would like to believe! Discover Manchester’s influence, learn more about the food the characters love, find out what’s real (like that Mark book), and find out more about London Fields where many of the characters live and love. Thanks so much for your kind words. I wish I could take credit for the design of my website, but I’m useless at coding! 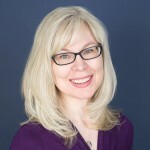 My website was created from scratch by a programmer in the US. It’s not a set theme. He took instructions from me, and the marketing group who is handling my book, and this site is the end result. Good luck with your personal website.